Only about 1,300 meters (4,265 feet) wide, the Naruto Strait separates Tokushima Prefecture on the island of Shikoku and the smaller island of Awaji. In this narrow channel the waters of the Seto Inland Sea and the Pacific Ocean come together. Due to the large difference in water level of the Seto Inland Sea, hemmed in by land, and the open waters of the Pacific Ocean, the ebb and flow of the tides causes extremely rapid current, which is rushed against the topographical complicated sea-bed and form giant eddies known as the Naruto Whirlpools. Since ancient times, the awesome view of the Naruto Whirlpools has stirred the imagination of many poets. Rapid flows create whirling currents at low tide, especially during the spring flood tides that occur around April. At this time you can see numerous whirlpools where, in the surface of the sea, eddies carve swirling holes that are about 10 meters (32.8 feet) across and 2 meters (6.6 feet) deep. These persist, moving southwards for several dozens of seconds in currents that may flow at a speed of nearly 20 kilometers (12.4 miles) per hour. The whole area from the Seto Inland Sea to the Naruto Straits is part of the Seto Inland Sea National Park, and one of the main sightseeing attraction is the Naruto Whirlpools . Visitors can view this exciting spectacle from excursion ships or from the observation area in Naruto Park on Oge Island in Tokushima Prefecture. Construction of the 1,692-meter (5,551-foot) long Onaruto Bridge was completed in 1985, but before work began in 1976, a great deal of care was taken in the design so that the project would not spoil the magnificent view of whirlpools. It is also well known that the fish and seaweed growing in these fast-flowing tides in the Naruto Straits taste great. 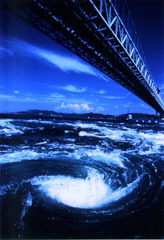 Photo: The whirlpool in Naruto Straits (Tokushima Prefecture).